One thing that is often overlooked when configuring JIRA is Screens and Screen Schemes and how they connect to your Issues and Projects. In this blog, we'll cover the setup and our suggested best practices for Screens and Screen schemes in JIRA and how to associate them with Issue Types. You can read more about Schemes and Project configuration in this article. A Screen is a defined collection of fields that appear when an issue is created, edited or viewed in JIRA. It gives you control over the information you want included in your Issue, depending on what type of Issue you are creating or editing. For example, when I create an issue for my support team, I would want different information in the ticket than if I were to create a user story for the development team. We at Tempo consider it a best practice to create three copies of each Screen for each Issue type: One for creating the Issue, one for editing and one for viewing. One reason for this is, for example, when you create an Issue, you only need a few required fields, but you may want to add more later when work has started on the Issue. The Create Issue screen would then only include those few required fields and the Edit Issue Screen would include more fields. This also has to do with the Screen Scheme, which we cover below. Navigate to the Issues Administration page and select Screens from the left sidebar. Name your Screen and write a description - The name should be descriptive and say exactly what this Screen is intended for, e.g. "Create Support Issue Screen" or "Edit Bug Issue Screen". The description should include any additional information, like what project the Screen is used for. Add fields to your Screen - The Summary field is the only required field, but that's hardly enough for any Issue. It's best practise to keep the number of fields to the bare minimum to make issue creation simpler (e.g. if you are not using versions in your project, you can leave out the Versions field). Like mentioned in step four that the Summary field is the only field that is required and that you should try to keep the number of fields down to a minimum. You will still be able to create a Screen without the summary field, but you won't be able to use that Screen to create Issues. That being said, we'd like to name a few fields that we find really useful (and necessary most of the time!). These fields are optional, as you may not be using Accounts or Teams in your Project, but to be able to estimate time on issues, it is necessary to include the Time Tracking field. 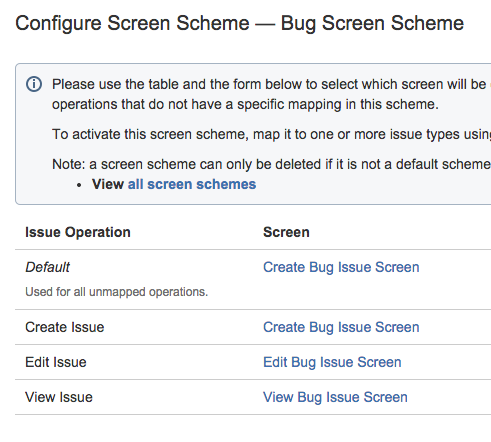 A Screen Scheme in JIRA allows you to associate certain Screens with Issue Operations. There are three operations that you can link to: Create, Edit and View. Here, you link the three screens you created previously to their respective operations. This may seem like extra work at first, but later when you want to add or remove fields to any one of your screens, you can edit each screen without affecting the others. Navigate to the Issues Administration Page and select Screen Schemes from the left sidebar. Name your Screen and write a description and choose a Default Screen. Press the period button (".") at any time in JIRA to open the quick navigation dialog. Start typing the name of the page you are looking for and open it by pressing the Return key. 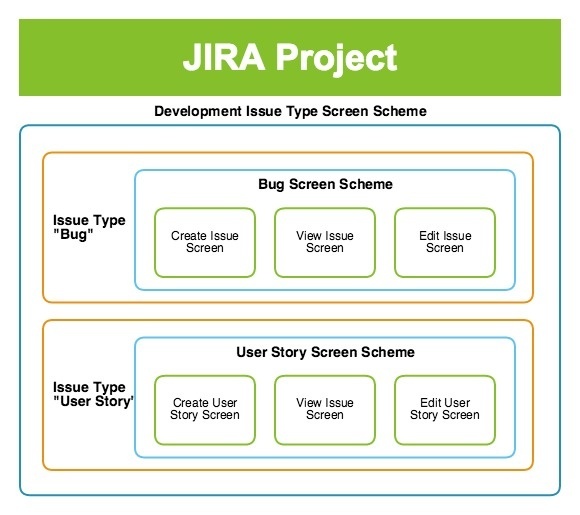 A Screen Scheme is not associated to a JIRA Project directly, but via the Issue Type Screen Scheme, which is associated to a Project in JIRA. The Issue Type Screen Scheme is where it all comes together. 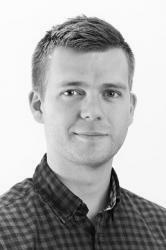 It enables you to associate a Screen Scheme with an Issue Type within a Project. Workflow Screens are exactly the same as the Issue Screens, except that they are not used in Screen Schemes. Instead of associating a screen with an Issue Operation, the Screen used is a workflow transition. That way, you can make a screen appear when an issue transitions between workflow statuses. This feature makes the the workflow engine even more powerful. The ability to add information to the issue as it travels through its workflow is valuable. 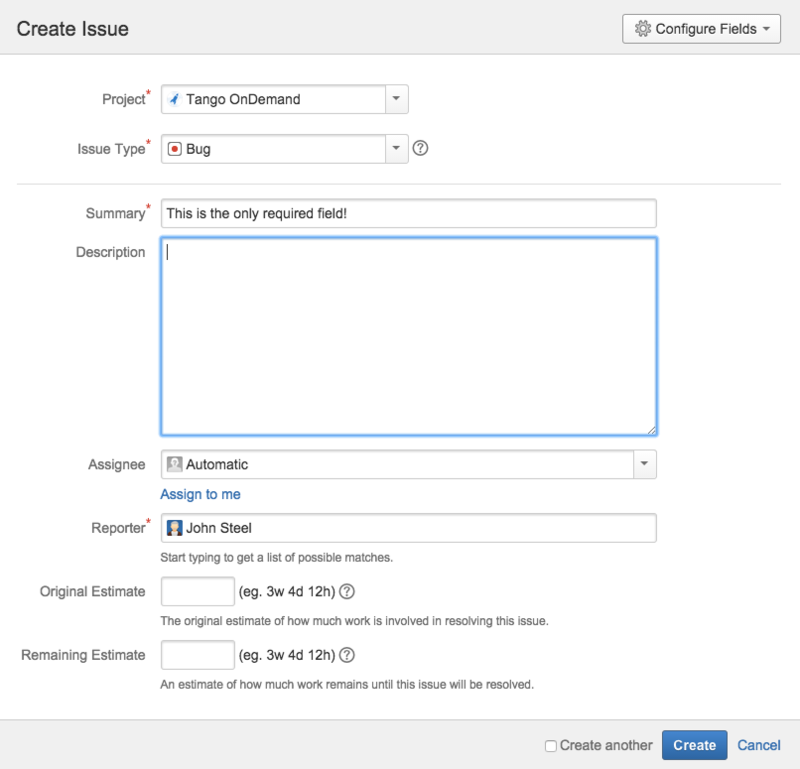 An example of a Workflow Screen is the Resolve Issue Screen (which appears in the Default JIRA workflow). The Resolve Issue Screen appears when an Issue is Resolved in its workflow, and includes fields that are important at that point, like Resolution. We consider it a best practice to create separate screens for Workflow Screens and Issue Screens. A workflow Screen does not require the Summary field, and it can in fact have no fields. When you create a blank Screen and use it in a workflow, it will appear with only a Comment field. You can also configure your workflow to set a default value to a field when it transitions but we'll cover that and advanced workflow configurations in a later blog. I hope this blog explains what we recommend as JIRA Best Practices when it comes to creating Screens and Screen Schemes. This is built on Tempo's several years of experience in managing JIRA instances for ourselves as well as our customers.